With a name like Netflix, you'd think that Netflix would offer more than just mail-order DVD rentals. Well, it's going to happen. Netflix will be offering subscribers the ability to watch movies and TV shows on their computer for no extra charge. It will be rolling out over the next six months but only for 1,000 movies and shows at the moment, compared to the 70,000 DVD titles currently offered by Netflix. Don't worry about the in-browser movie, it can go full-screen. People that do not currently use Netflix but would like to subscribe to only the online viewing capability can try a 5.99/month plan that allows 6 hours of movie watching per month. Customers on the popular 17.99/month plan receive 18 hours of online content viewing in addition to the DVDs by mail. Netflix will expand from their current 1,000 online viewable movies and shows as soon as they are able to secure more licenses. Now, on to the technical aspect. The press release says "PC" all too frequently, leaving me to believe this service won't work on Macs. A trip to this New York Times article explains that "the service uses streaming technology that Netflix built on top of Microsoft software." The keyword in that sentence being Microsoft. However, there might be hope in the next year as Netflix tries to expand this service to include more devices. Although I have a feeling they mean Zune when they say portable devices and not iPhone. The service, which will be introduced over six months, works only on recent versions of Windows and Internet Explorer. Over time, Mr. Hastings hopes to expand the catalog of titles and make the service available on other hardware and software combinations, including set-top boxes, television screens and portable devices. Unlike most services, such as Amazon Unbox or GUBA, where users must wait for the video file to finish downloading, Netflix streams their content to viewers online. Depending on the consumer's connection the quality of the movie will vary. At the highest end of the internet connection spectrum, consumers will receive a DVD quality video. But this format of content delivery completely rules out users who wish to view the video without an active internet connection, eg while on a flight. The Netflix feature uses real-time playback technology that allows video to be viewed at virtually the same time it is being delivered to a user's computer. Following a one-time, under-60-second installation of a simple browser applet, most subscribers' movie selections will begin playing in their Web browser in as little as 10 to 15 seconds. Movies can be paused and a position bar gives viewers the ability to immediately jump to any point in the movie. In all, the instant watching feature requires only Internet connectivity with a minimum of one megabit per second of bandwidth. All in all, I gladly await this new service. 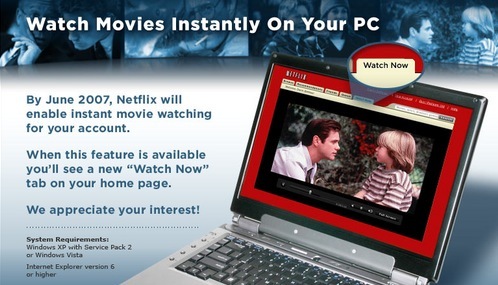 No longer will the roommates and I have to make trips to Blockbuster on a boring night - just hookup the MacBook, running Parallels or Boot Camp Windows XP of course, to the living room TV, log on to Netflix and click play on any movie we fancy within the "Watch Now" tab. Edit: However, with the slow adoption of HD-DVD and the need for high-definition, Netflix's online viewing feature may be short lived. In 5 years time when many people have 10megabit lines (or 50megabit FIOS lines), will they ramp up the video quality so we can begin seeing something closer to HD-DVD quality? Time will tell.